Want to skip to the results? 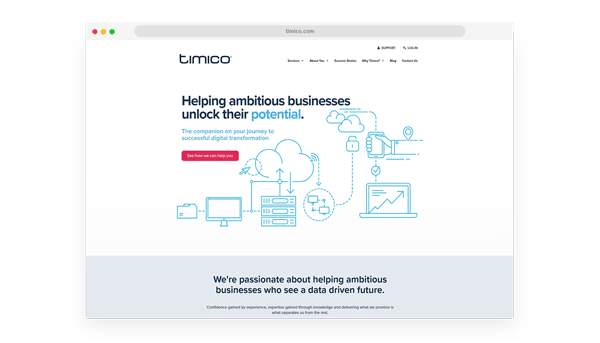 View the Timico website HERE. Timico is a managed services provider that delivers world class connectivity, workplace and multi cloud services to retail, leisure and professional service sectors. Their previous had helped the company grow at a fantastic pace, but it was time to redesign and rebuild the site to match their new messaging and brand that was being worked on. The brief came to us through our digital partners, Gripped. Gripped is an inbound marketing agency out of London, who have worked with some enormous clients, delivering exceptional inbound campaigns, digital solutions, and brand messaging projects. It was our second collaboration together (the first was Chronicle Software), and as always, it was a fantastic project. With a beautifully designed set of mock-ups provided by the Timico team, the execution was down to us. We worked closely with Gripped throughout the process to ensure the client’s requirements and messaging were being implemented in the best way possible throughout. When all was said and done, the Timico website focused on four key areas to drive conversions and traffic: products, personas (pages that target specific buyer personas, as well as communicate tailored messaging to visitors), social proofing (case studies to provide reassurance for prospects) and business proofing (communicating why Timico has the capacity, product and skill to provide to businesses). The result was a bold, re-branded and heavily thought out solution, for an industry with plenty of competition and plenty of copy-cats. Gripped has continued to provide inbound support and implementation for Timico, and Affios has supported with ongoing site maintenance. To view the Timico website, just click HERE.